For many years Wolwedans has been on my bucket list of destinations and a place I have truly coveted to include in our Portfolio. Having just returned from an immersive few days it gives me great pleasure to announce the wait is over. 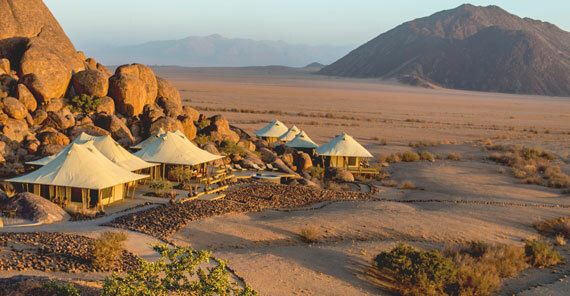 We are delighted to welcome WOLWEDANS PRIVATE CAMP & BOULDERS SAFARI CAMPas a member of Classic Portfolio. The vast 220,000ha privately owned NamibRand Reserve landscape of red dune belts, gravel plains, mountains and "inselbergs" is incomparable to anything I've ever experienced. The powerful silence of this wild desolation beckons your soul. It is simply out of this world. RATES: NAD 8 632 (± US$ 600) pps per night. 3rd and 4th nights discounted by 50%. FIXED ARRIVALS — Only on a Monday or Thursday for a 3-night stay, or Thursday for a 4-night stay, ensures each guests time here is sacred with no interruptions. 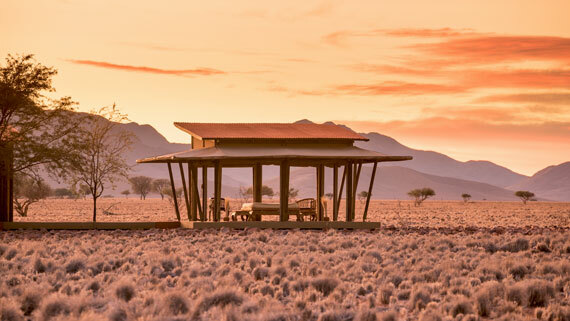 EXCLUSIVE — 5 x Tented suites, 50 000-hectare traversing area, 45 km south of Wolwedans. STAY PAY OFFER - Stay 3 nights pay 2½, stay 4 pay 3. RATES: NAD 9 080 (± US$ 630) pps per night, minimum 3 guests. ULTIMATE PRIVACY — your own lodge with as much or as little service as you want, this is one of the most private experiences in Namibia and a regular hang-out of A-list celebrities. EXCLUSIVE USE — 3 x en-suite tents (with a 4th on the cards) for a maximum 6 adults and 4 children. Children accommodated in the sala or in igloo tents. COMBO PACKAGE — NAD 39 740 (± US$ 2 760) per person sharing for 5 nights. BOULDERS SAFARI CAMP — Stay 3 nights and get 50% off 3rd night. WOLWEDANS PRIVATE CAMP — Stay 2 nights in combination with Boulders and the minimum exclusive use guest rate reduces to 2 (camp only booked exclusively). ROAD TRANSFER — Vehicle use for road transfer from Windhoek to Wolwedans included free of charge. Self-drive alternatively book a guide at NAD 1 000. ROAD JOURNEYS — Enjoy the drive. Wolwedans provides 4x4 vehicles from Windhoek for a self-drive or privately guided 6- to 7-hour scenic drive and a true discovery of Namibia. ROAD TRANSFERS — Combine with Sossusvlei and Wolwedans will manage road transfer between the camp of your choice. 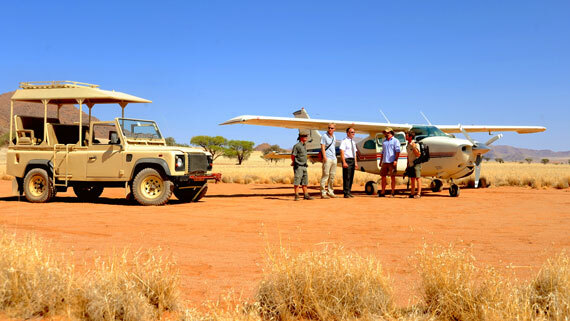 AIR ACCESS — Seat-in or private charters available from multiple airstrips to Wolwedans airstrip for Private Camp and Aandster airstrip for Boulders Safari Camp. Take advantage of the Wolwedans Road Journey from Windhoek and hire one of their Toyota Landcruiser Station Wagon 4x4's for a self-drive or guided drive. Stay the first night at one of the Sossusvlei lodges and after an early morning Sossusvlei experience head to Wolwedans. Only pay for the days you are using the car pre-arrival at Wolwedans. Fly back to Windhoek. What's equally impressive is the Wolwedans Foundation. Here is a tangible passion for everything they do and we admire each of their projects, from the Desert Academy, and NICE (Namibian Institute of Culinary Education) to the infrastructure for water and solar power and the vegetable gardens that provides energy, water and fresh greens to the camps. For the German speaking markets and Benelux, Hella Göbel, SABELA AFRICA, is responsible for agent relationships. Classic Portfolio will manage international sales from our offices in USA (Kimi Christopulos) and UK (Cara Prettejohn). With sweeping views of the Afromontane Forests, Melton Manor at Kwandwe is a contemporary frontier farmhouse with a modern touch. This sole-use safari villa, where the smallest detail of your stay is planned according to your specific wishes, is perfect for family holidays, parties or groups of friends. The welcoming villa with its four en-suite bedrooms are cleverly designed around the central courtyard and its large, inviting swimming pool, while the interiors humorously combine traditional mid 20th century furniture with the latest in South African design. Our favourite is the interactive farm-style kitchen which invites guests to try a hand at combining flavours under the cheerful guidance of their personal chef or if the guests would rather have a more relaxing time, they can simply watch as the chef cooks up wholesome and delicious snacks whenever they want.